This was the 15th kakejiku made in preparation for Dee Tellers exhibition at Asia Speaks. 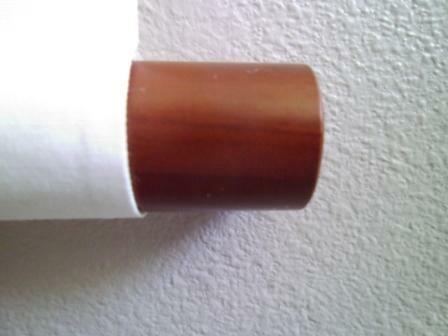 This scroll is also done in the Fukuro Hyougu style. I think the gold medallions in the paper are highlighted by the silver cloth. 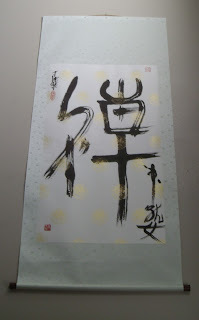 This calligraphy is strong, so I used the informal style to put the calligraphy in the forefront. 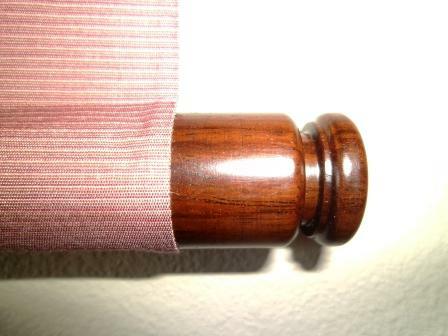 The scroll is completed with and Enshu Shitan Jikusaki, which is rosewood with a lip at the end. Customer Response Made My Day! The scrolls arrived a couple of days ago, and they are just beautiful! Thank you so much for the wonderful work and the amazing presentation it was a joy working with you, and we both enjoy the scrolls very much. Looking forward to hanging them up and working with you again in the future! Best regards! This landscape painting is the 14th in the series for the Asia Speaks exhibition by artist Dee Teller. 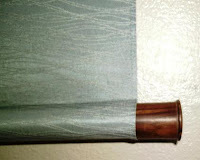 Dee requested to have a very simple scroll design to show off the color and technique of the painting. 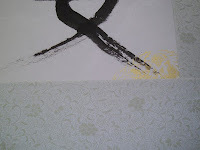 It was done in the 袋表具 Fukuro Hyougu style and has a 1.5 mm border of black 筋 suji around the edge of the painting. 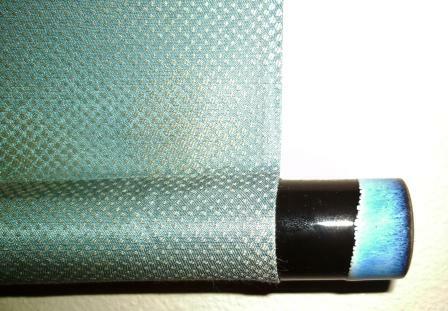 The soft gray/teal color of the cloth seems to bring out the greens in the trees and grasses and light blue colors of the water. The black suji really gives a lighter/darker/lighter/Darker pattern for the viewer. The scroll is completed with a black lacquer wood jikusaki 黒塗り軸木. I really think this one matched the painting beautifully, and became one of the most beautiful paintings for the exhibition. 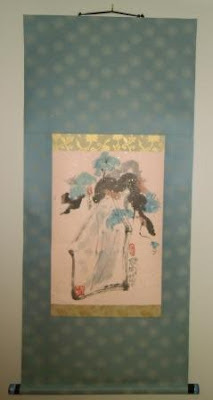 This is the 13th work in a series by Dee Teller for her exhibition called Asia Speaks. 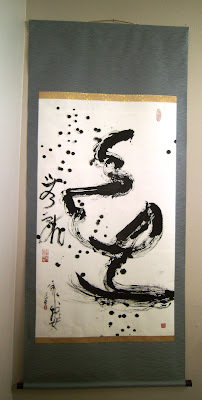 This one I ended up liking very much, not just because of the simplicity of the design and how it blended with with the Calligraphy of Play (遊び）Asobi but also because of the quality of the end result. The calligraphy is in a full cursive style. It is bordered with a Gold on Tan Ichimonji that has a very large Karakusa. I cut the ichimonji a little wider in order to show off the arabesque pattern. 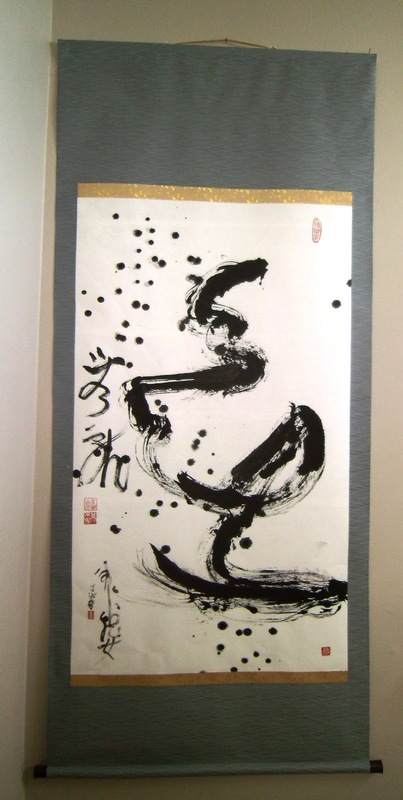 It is hard to see, but the cloth actually has some offsetting horizontal striping in it, and seems to complement the light brush stroke of the calligraphy. 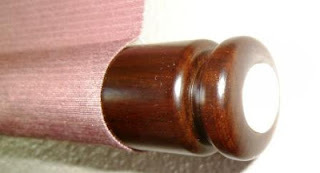 The scroll is completed with a Rosewood jikusaki, that has a pattern cut in and bone inserted. This is a very beautiful and elegant touch for the artwork itself. I had such a difficulty with this scroll. 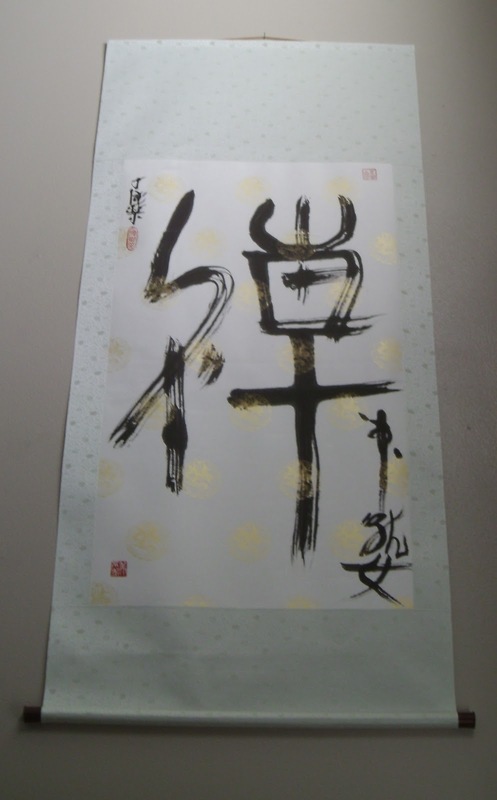 In the original mounting, the black dots at the top experienced some significant nijimi (smudging/smearing). In the bottom right area, I had problems with the scroll paper tearing when I applied the Souurauchi. What this tells me is that I am so imperfect, and must work every day to improve and become better. When designing this scroll, I wanted a cloth that would provide the feeling of air rushing about as the dragon flew through the air. I think this was accomplished by the pattern in the grey cloth. I used an Enshu Kokutan (Paper Lantern shaped Ebony) jikusaki for this scroll. I think it went well with the entire scroll. As you can see from the dimensions, this is a very large piece to mount and is very difficult. I just wished it had turned out more perfect. 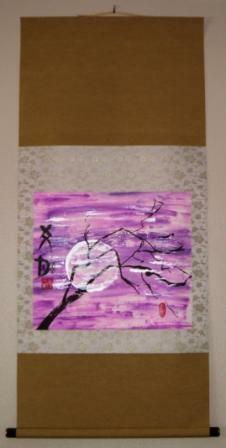 This was the 11th scroll done in a series for the Dee Teller, who has a one artist exhibition for Asia Speaks. 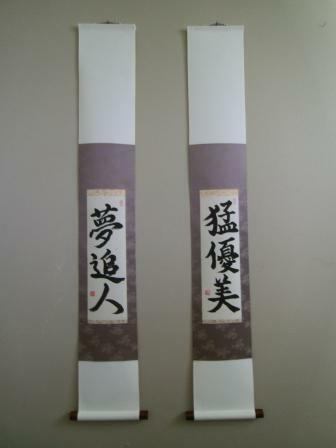 I originally designed this as a Fukuro Hyougu style scroll, but had some difficulty with the Suji. 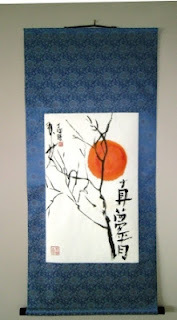 I wanted a cooler color to go with the orange Moon, so I originally used a plain Navy cloth with silver Suji. 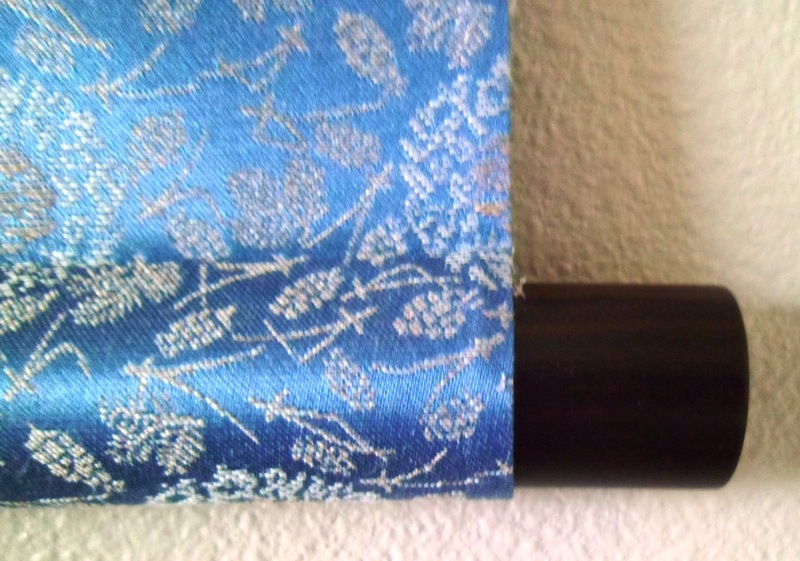 The silver Suji did not adhere like they normally do, and as a result, I took it off and redid it with this patterned blue cloth. I wanted to keep it cool, but I was concerned that the leaf pattern would be disturbing to the image, but it seemed to make sense after putting next to the bare branches. The jikusaki was a very simple ebony wood. 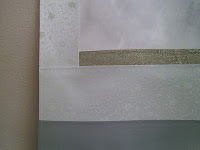 It is simple and provides a good contrast to the end piece. This scroll was made as a wedding present. 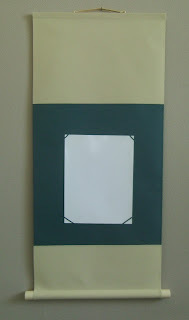 They will be able to insert the picture they wish into the scroll to hang. This is called Shashin/Hagake/Shikishi Kake style. It is done on occasion, as an alternative to hang photos and pictures, and allows flexibility for the picture to be changed in or out. The colors were done to try and match the couples color scheme for the wedding. The off-white/eggshell seems to match pretty well, but I could not find a brighter blue to match the color, but did the best I could. These scrolls were made as companion pieces. They are beautiful, done is a Sandan Hyougu (三段表具）style with some good contrasting elements for a very soothing feel. They are both written in a semi-cursive style, but the second was translated by Yoshimi. The first character is fierceness 猛（もう）or mou can be greatly energetic, fierce or ferocious and 優美（ゆうび）or yuubi can be read as grace or refinement. Fierce Grace. 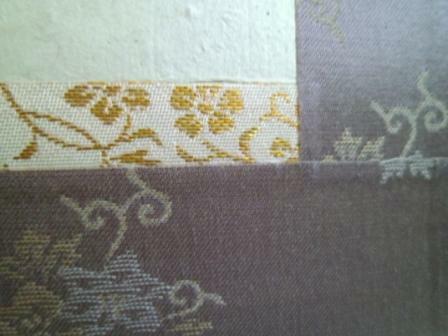 The Ichimonji is a white on gold, and the purple Chuumawashi cloth has a simple pattern. 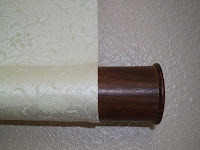 The Bone colored cloth is a strong contrast with the purple and the Deep Brown stained wood jikusaki. The kakejiku is finished with the Takuboku hanging string. The jikusaki is a beautiful two toned glazed ceramic. 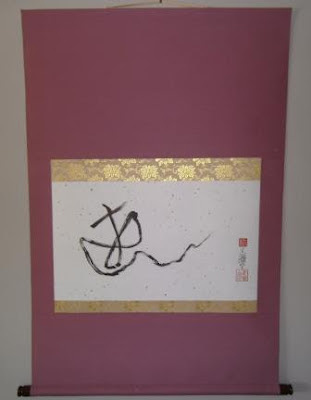 I used a ginran 銀襴 instead of a kinran 金襴 for the ichimonji bordering the artwork. 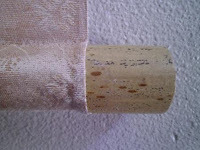 This means that this cloth is made with silver filament thread instead of the gold filament thread. It is very beautiful. I used a silver for the chuumawashi of this cloth as well, but the difference is that it has a smaller Karakusa (arabesque) pattern in the cloth. For the Ten/Chi I used a gray/slate colored cloth that has a hint of blue. 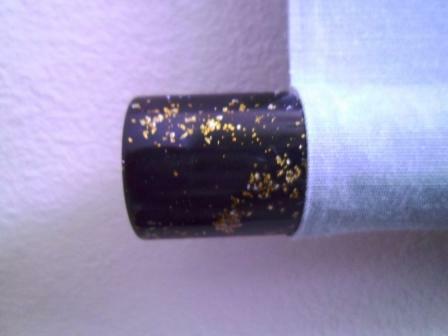 The Ichimonji for this scroll has a black lacquer with gold/silver fleck in it. It really adds some extra character to the scroll. It is titled Sing (Spirit Woman). I felt this needed a more neutral cloth, so I selected a flower pattern with a light brown. I used a gold on gold Ichimonji to keep the focus on the painting. The Jikusaki are bamboo. This is a large scroll. This is the eighth kakejiku or wallscroll in a series for an exhibition by artist Dee Teller. You can purchase her art at the website provided. It is titled woven moon. 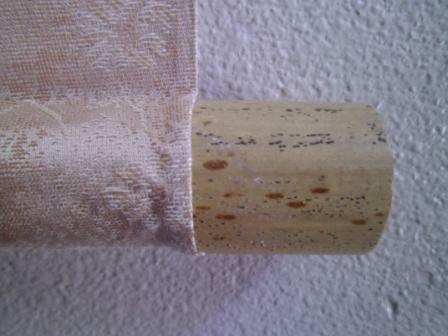 This scroll is completed with a black jikusaki that has a gold ring around the outer edge, and a Usu Kincha Hanging String. I am really happy with the way this scroll turned out.